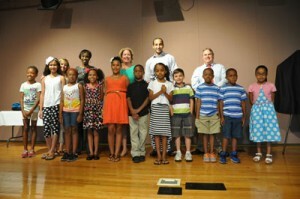 August 7, 2014 – (Woodside, DE) – On July 30, 2014, Delaware State Housing Authority (DSHA) honored students in the DSHA housing community for achieving academic excellence by making the honor roll and having perfect attendance, with a luncheon and awards ceremony at Polytech High School in Woodside, Delaware. First Lady Carla Markell made remarks, praising the hard work and achievement of the students. This year saw our largest class in the history of the program, with 73 students receiving awards, including one Special Recognition for a President’s Award winner and a student continuing his job skills training. The annual luncheon has been a tradition at DSHA for more than 20 years and serves as a way to recognize the children’s successes and highlight the importance of a support system. While children may still be in the summer vacation state of mind, DSHA rewarded their hard work by giving them a head start on back-to-school shopping with necessary, age-appropriate school supplies as well as some other high-quality items including brand new L.L. Bean backpacks. with a few of the students recognized at the award ceremony. Brooke Giordano, going into 8th grade, received an award from President Obama for Outstanding Academic Achievement. She is a student at Central Middle School and she is a repeat winner of the Honor Roll award. Founded in 1983, the President’s Education Awards Program (PEAP) honors graduating elementary, middle and high school students for their achievement and hard work. The program has provided individual recognition from the President and the U.S. Secretary of Education to those students whose outstanding efforts have enabled them to meet challenging standards of excellence. Each year, thousands of elementary, middle, and high schools participate by recognizing deserving students. 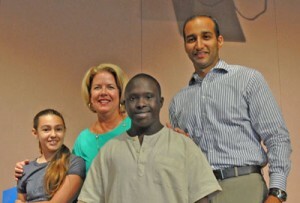 Another special recognition went to Ronnie Woodus, Jr., who graduated from the Charleton School this year. Ronnie will be going on to continue his education in job skills until age 21. As part of the National Association of Housing and Redevelopment Official’s (NAHRO) Housing America Campaign, a poster contest is held each year for children residing in affordable housing sites. This year’s theme was “What Home Means to Me.” Delaware’s 1st place winner was Quneek Monay-Yvette Wilson, a 5th grade student from Dover. The poster was framed and presented to Mrs. Markell at the luncheon. 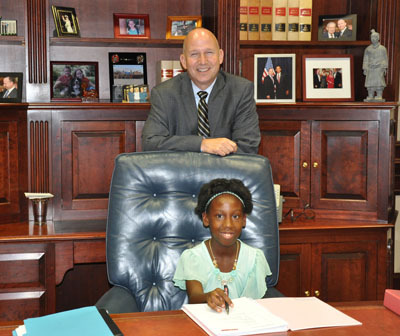 Governor Jack Markell was on hand Wednesday for the official ceremony to hang the poster in the Governor’s Office.